This small and unsuspecting island may appear to be unsubstantial, but what it lacks in size it makes up for in history and attractions. 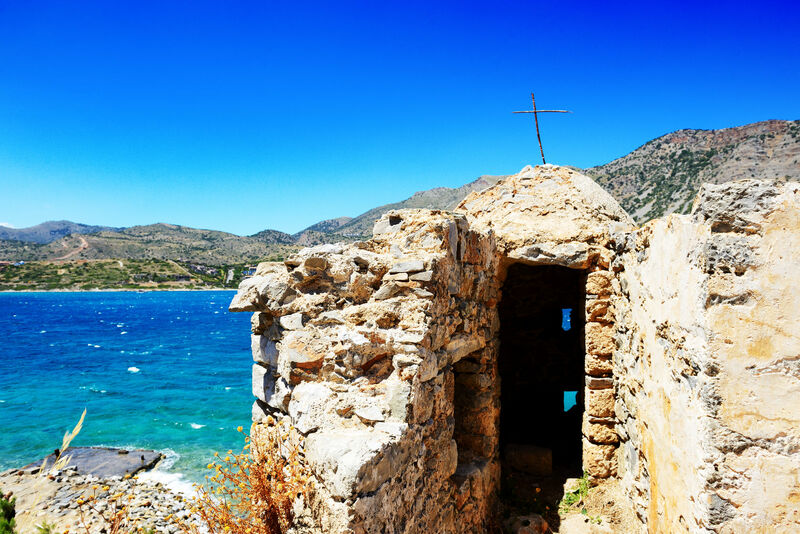 Should you be thinking about visiting the island be sure to consult the following artcle to ensure you get the most from your day trip to Spinalonga Island. But first, you are probabling going to ask where on earth is Spinalonga? Spinalonga (or Kalydon as the locals know it) is a rocky islet found harbouring in the Gulf of Elounda on the picturesque Cretan north coast. Some of you may even find that you have a vague recollection of the island, this is not surprising considering that Spinalonga has featured in a number of British novels, films and television series, namely ‘Who Pays the Ferryman?’ and as the setting for Victoria Hislop’s novel, The Island. Over the centuries the island has continually reinvented itself, while each and every inhabitant has left a distinct mark upon it. Some 500 years ago, it was the Venetians who were first to leave their impression upon the island, and arguably the biggest, for through the sheer force of labour they severed, the what was then peninsula, into a separate island detached from the mainland. The island was carved out from the coast as part of a military strategy which included the construction of a fortress, which rendered the island impregnable to aggressors. Despite the gritty determination of the Venetians, their stranglehold over the island was eventually relinquished as they were ejected from Spinalonga by the conquering Ottoman Turks. 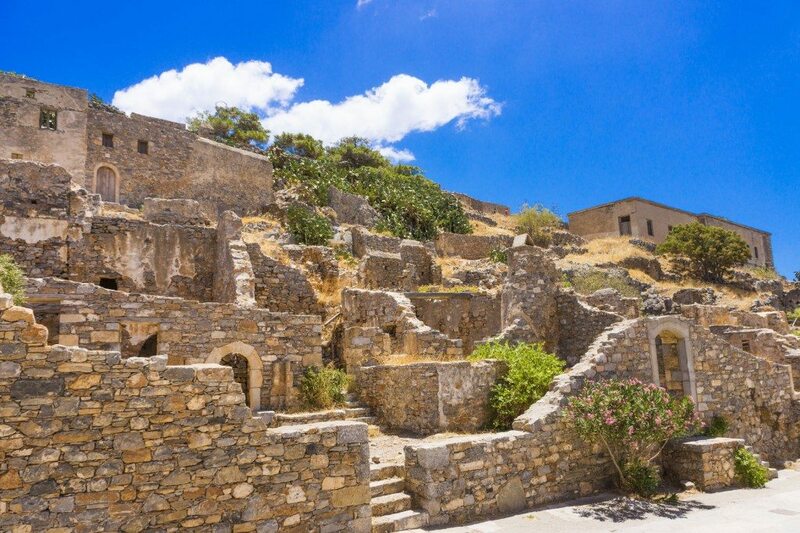 As the 20th century began, so did the next chapter of Spinalonga’s history. The island, once fortified for military advantage, was instead employed as a means to protect Cretans from the islands new undesirable residence; lepers. Astonishingly, Spinalonga served as a functioning leper colony until it’s decommission in 1957, bestowing it the unusual honour of being one of the last active leper colonies in Europe. The leper’s arrival was met with nervous anticipation and uncertainty as patients were kept in ignorance about what fate awaited them. An uncertainty reflected in the chilling name given to the tunnel that leads up to the leper colony entrance that was known as ‘Dante’s Gate’. However, the fate that did await them was typically more positive and humane than if they chose to remain on the mainland; where they would have been banished from their homes and forced to live in isolation. Today, the island is uninhabited but witnesses a daily repopulation as tourists flock to the island to visit what has become one of the most popular tourist attractions in Crete. 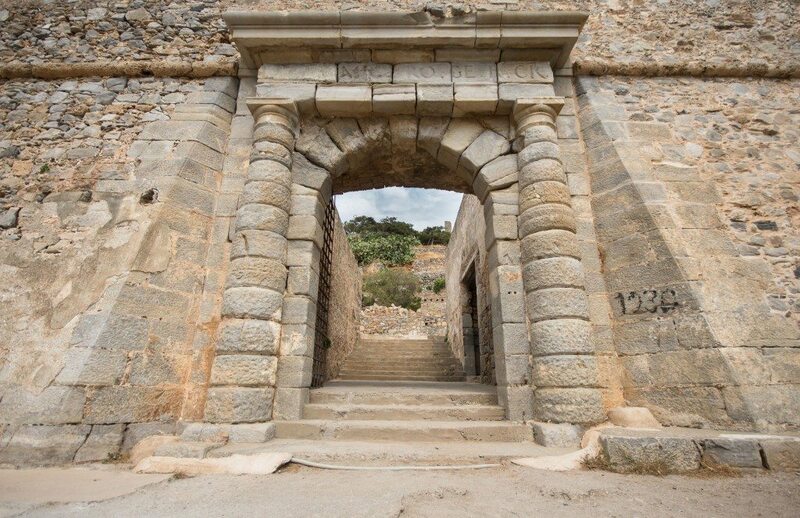 Should you choose to visit Spinalonga, tours are frequently held and trace the journey of the leper patients all those years ago, beginning with entering through Dante’s Gate. These insightful and fascinating guided tours allow visitors the unique opportunity to delve and explore the island’s rich past, beginning with a tour of a street that has accurately reconstructed to look how it would have when it was a street apart of the leper colony. It is said one can imagine the sense of community which existed between the island’s patients as one is guided along the island’s narrow lanes lined by quaint cottages, local church and graveyard in the shadow of the old hospital atop the hill. If after the tour, you are left wanting to know more of the island, there is a museum which digs back centuries into even earlier chapters of the island’s history. After the tour there is no sense in rushing off, but instead should stay and enjoy island’s unspoilt seafront that is accessible by turning left by the old town hall down to towards the sea. Undoubtedly, Spinalonga is an ideal place to amerce yourself in rich Cretan history or instead wade in the shallow waters that gently lap the island’s pebble beaches. The good news for visitors is that the island can be easily accessed by boat from a number of nearby ports. If departing from Agios Nikolaos harbour, excursions can consist of a 40 minute boat ride journeying across the Gulf of Mirabella due north towards Spinalonga. However, departures from other ports and harbours (including those of closer proximity including Plaka and Elounda) are also available. Ask your travel representative about the Spinalonga island tours as these charming cruise excursions are proven to be enormously popular among tourists. Explore and discover the Cretan north coast as you sail upon calm waters, before being delivered to the island of Spinalonga with time to delve into its rich history and attractions. To conclude a perfect day, customers are invited back on board where they are then whisked away to the next port of call in the beautiful bay of Kolokytha. Here, you can have a spot lunch, explore the shops and wander the lanes of the quaint fisherman’s village before taking a leisurely return back to the port of Agios Nikolaos. Notably, tours and excursions are subject to seasonal demands and as such they are usually available between May and October. Adult prices range from €33 per person with children and concession prices priced around €17. Although there is no accommodation on Spinalonga, at the nearby Elounda guests can have their choice of 5 star accommodation including the three sister hotels; Elounda Mare, Porto Elounda Golf & Spa and Elounda Peninsula. These three Elounda hotel’s come highly recommended with impeccable reputations and are ideally situated offering unrivalled views overlooking Mirabella Bay and the Aegean Sea. Inside, the Elounda hotels are tastefully designed while their facilities including golf course and restaurants can usually be accessed by all guests. Whatever you decide to choose, it will always be the right decision when choosing between the Elounda Mare, Elounda Peninsula and Porto Elounda hotel. Now that you have read the blog, are you tempted by a day trip to Spinalonga? Or maybe you have been before and would like to share your experiences for the benefit of first time visitors? Share and comment below!